Manilkara. (From the Malay name for the genus.) Sapotaceae. Some 70 species of evergreen trees to 30m or more, with milky latex. Leaves alternate, spirally arranged or rarely opposite or whorled, thick. Inflorescence axillary, flowers solitary or in clusters, bisexual; sepals (4-)6(-8), in two whorls; corolla 6(-9) lobed, tube usually much shorter than lobes, divided to base into 3 segments, central erect, narrow, clasping stamen, outer spreading, petaloid, entire, divided or laciniate; stamens 6(-12), usually alternate with (0-)6(-9) staminodes, ovary superior. Fruit a fleshy berry, ovoid or globose, 1-several seeded, seeds large, ellipsoid to obovoid, with narrow elongate scar. Pantropical. Z10. Manilkara zapota produces a milky exudate, balata, hard and brittle until chewed, the inelastic polymer originally used as the base for chewing gum. This species, in many areas tapped to exhaustion, no longer fufills the requirements of the industry and other lactiferous members of the Sapotaceae, Moraceae, and Euphorbiaceae are used. Manilkara is native to lowland forests of central America, but is grown for chiclé especially in the Yucatan Peninsula of Guatemala and Mexico. 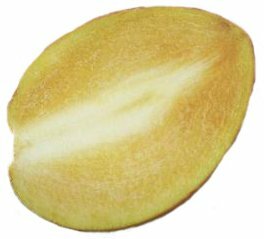 It is also valued throughout the humid tropics for its delicious fruit, sapodilla, slightly larger than a plum, with an aromatic pulp reminiscent of honey and jasmine, very sweet and slightly acid, eaten perfectly ripe since it has a high tannin content. A good tree produces 300kg of fruit per annum. Manilkara grows best in well-drained soils of pH 6-7, and is resistant to drought, wind and salt. In temperate regions it can be grown in hot glasshouse conditions in a rich sandy loam with bright filtered light, watering moderately to plentifully. Propagate from cuttings or from seed. 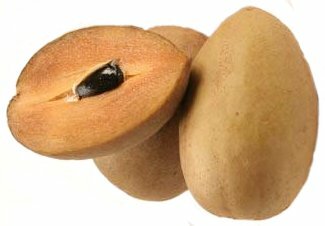 SAPODILLA; NISPERO; CHICLE. Tree to at least 30m. Leaves 6.6-14.4 x 2.1-5.2cm, on 1-3cm petioles, in clusters at twig apices, glabrous, elliptic to oblong-elliptic, ovate-elliptic or elliptic-lanceolate, subglabrous, chartaceous, vein pairs 15-23. Flowers solitary, sepals 7-9.5mm, ovate to lanceolate, corolla 8-11mm long, lobes 6(-7), sometimes lacking outer segments; stamens and staminodes 6, the latter (2-)2.5-5mm, oblong, elliptic or lanceolate, somewhat petaloid. Fruit 3.5-8 x 6cm, broadly ovoid or ellipsoid, rough and brown, pulp sweet, translucent, somewhat granular, pale yellow-brown; seeds 2-10, glossy black. Mexico to Costa Rica. 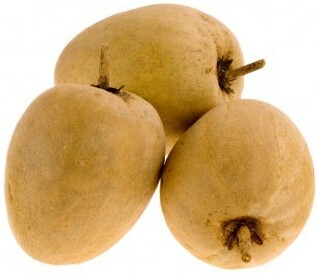 ‘Brown Sugar’: fruit small to medium, very sweet. ‘Prolific’: fruit large.